I have been listening to the series every morning, it is around the time I drop DD off at the bus stop. 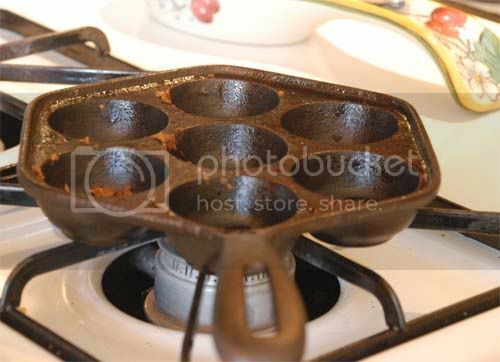 No South Indian home would be without that contraption, called paniyaram pan in my parts. I love them too. I use moong dal most of the time. Love the low fat Bondas, great color and easy too. 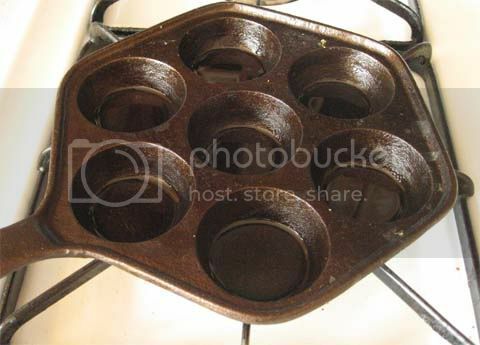 I have 2 of those pans, cast iron Indian and Dutch one too. Got to be very careful about those hot iron handles. I am used to well insulated handles usually of other pans, I have grabbed this handle to flip the appes and screamed like little girl once. Then bought a handle cover (like a tube) made just for that hot iron handle. Love all the cast iron pans except the fact they can burn your hand real bad if you forget and grab them without wearing insulated gloves. Your bondas looks great. Nice to see the pan available on amazon! I would never have thought to look for it amongst Dutch pans!! Cool find! Thanks for letting the world know! We shall no longer be appe-pan-deprived now! lovely snaps.... and equally easy recipe too. 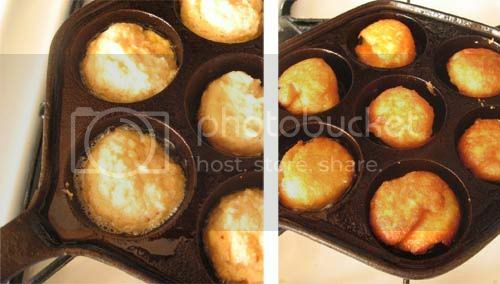 We didn't have this pan, nor do I remember others around us having it (or serving such stuff) - in our homes, at least where I grew up, they would be just deep-fried freestyle in oil! It's only after I met some Tamilians that I learnt about this pan and paniyarams. I've been tempted to get it but I would only use it once in a blue moon so perish the thought! I have that appam pan and dal vadas have been on my mind for a while....maybe today's the day! Just yesterday I heard on the news that India has a plan to achieve 100% literacy by 2020... yeah it takes that long for literacy, basic education will arrive only after that! My nephew was interviewed all sorts of things at 1 1/2 years only to get into play school...there's too much pressure on a child in India! Dal bara's are a popular snack at Mumbai office canteens too. heavy/deep frying thekhe eyia beshi healthy mone hoye ..and dal bora khete bhishon iche hoche,tobe amaar mik chi jodi sath daye to :).. There are many good schools in India where they don't have "interviews" to get in, but these are the exception rather than the rule, unfortunately. Its a pity in the past, politics has been about getting votes and staying in power and education for our children doesn't seem to have been a priority with the government. But I am seeing a change and hopefully things will improve sooner than later. Many good schools don’t do these stern interviews and there is always hope in every situation. (I went thro all the process of facing interview and interviewers for my daughter's admission back home, that was not pleasant but I don’t see any other way round,unless we ourself create some more schools and places for every child)..If we can’t amend some things, then we shouldn't be saying against it. Why not start educating a poor child for free at home or sponsor a maid's child for a beginning inspite of blaming politicians or system for a change. ami ei borhate ektu kalojeere ebong dhonepata diye thaki. ei recipeti mosur dal diye khub bhalo lage!! I have a cooking book where recipes from the truck roads, ilove that book as it is so colour full but i don't think it has to do anything with the programme you mentioned. I don't havethis pan :-( i wish i bought one in India when we were there last time. I have seen som kind of pan here were they make a swedish dessert in it. I haven't EVER listened to the NPR on radio. I've always read articles. That said, saw your post on Desipundit :) Then had to come back here to tell you how I love this. I make this batter every now and then for my Adai (?) and I'd love something like this apart from just adai! I heard only bits and pieces of it, when he interviewed some girls of the Presidency college in Calcutta. 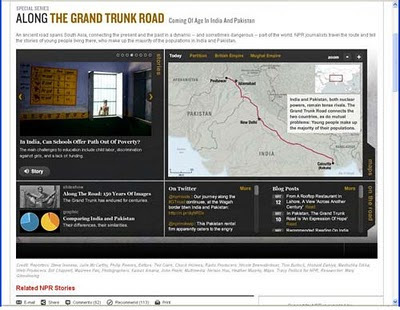 Thanks for the online link, will look at it. As regards to the kids education in Inida, it is amazing and scary at the same time. The amount of information 3 year olds are taught is appalling. Agree that my kid will be considered an illiterate there. thanks for the mention Sandeepa, using this appe pan is turning out to be a good investment considering the oil it is savin for deep frying. 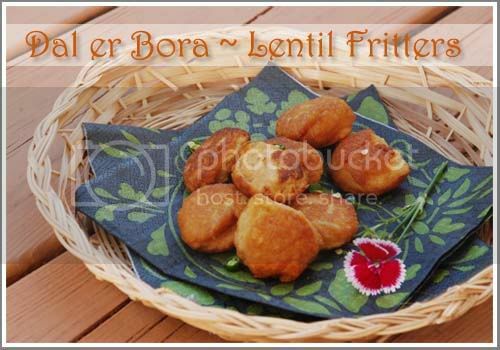 btw, the lentil fritters look great, we call it paniyaaram at home; delicious snack!!! 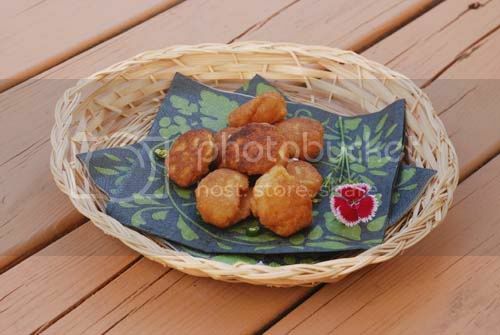 I don't have a paniyaaram pan, gotta get one !! That's the one you bought na? Thank you, Sandeepa! I think that's where I'd orginally found the rec too..Just bought it- can't wait!! hi this is really tasty.. i fried it in pan........thanks for this recipe..
nice recipes..I always follow your recipe.Abt that pan, I dont have gas stove.so is it good to use on electric heater stove? and when I try to make these bora paste,kemon jeno jhol theke jachhe tai bora banabar somoy thik chhoriye jachhe pan e..ki korbo? In search of a different Daler Bada recipe I landed here ( where else to go!!) and it was like searching for GT road and landing at the right place, the truckers..so did i land at right place..at your blog..
What a great idea to use the Appe pan. I have had mine for almost a year without putting it to any use. And the bora looks so cute too. Thanks. Can this pan be used in normal gas oven? 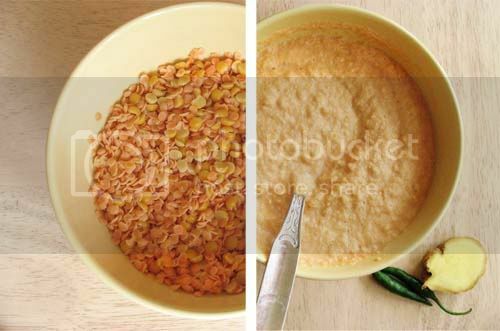 What's the difference between motor daal and chana daal?